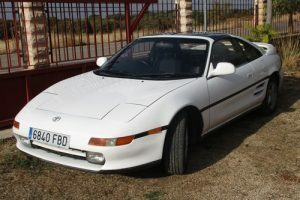 It seems we have a 2nd Toyota MR2 MkII G-Limited T-Bar Automatic in the club. Colour White. A mid-engined, rear-wheel-drive sports car. Manufactured from 1984 to 2007. Mk.I (W10; 1984–1989). Mk.II (W20; 1989–1999), MK. III (W30; 1999–2007) The MkII is fitted with a normally aspirated 2.0L 3S-GE engine producing 165 PS (121 kW; 163 hp). I have only had this car since April, bought locally near Villa Martin. It is in original stand with no renovations, I have fitted new tyres, new battery and everything is in good working order. As a Japanese import it is with RH drive. A TOAD security system has been fitted when it was in Cardiff by a previous owner. I hope to get used to that TOAD as I set the alarm of too often. For a car that is 25 years old, the road handling is excellent and the motor purrs like a caged lion. Foot on the gas and the clock goes past the 180 kmh. Probably 10 km or so incorrect but acceleration with the power button on the Automatic is a fast car for a 2 litre engine. My passion was always motorbikes and for the past 25 years I had been renovating motorbikes, then when I reached 70 I decided that I would change to renovating cars. 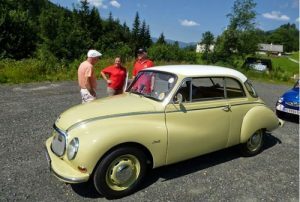 My last one is a 1958 DKW, F94 manufactured by Auto Union. It took 3 years and is in a good condition and is at home in Austria. The engine is or was a 900cc 3 cylinder but last winter I came across a 1000cc block had it reemed and honed out with new pistons and I rebuilt the engine which gives a few more HP. The 3 cylinder engine is a two stroke with 3 coils and 3 contact breakers so that you can tune each piston exactly. The DKW (Deutsche Kraft Waggon) was the first cars to be fitted with front wheel drive. The Auto Union was 4 seperate partner firms that produced the DKW vehicles. When the Berlin wall came along 3 of the partners where on the east side, consecuently the one in the then West Germany, August Horch, bought the rights and took over the sole production setting up factories in S. Africa and Brazil. VW made life difficult with DKW who bought shares. In the end unknown to VW the first audi prototype model 100 was made and VW chief was so impressed that it went into production and when launched in 1968 was a success.